Hecky’s. You’ve seen it. I’m talking about the one at 1234 N. Halsted. It’s integrated with a gas station on a very fluid stretch of Division Street. I’m sure it’s not as charming as the original Hecky’s in Evanston, but it’s all owned by the same legendary ribmaster, Hecky Powell. What side do you get with your ribs? In somewhat of a deviation from my standard operating procedure, I went with the baked beans (the cole slaw was standard). As you know, I usually pair big chunks of bovine or swine flesh with either a grain or potato. But with ribs it’s just a little different; I don’t feel the need to get a starch in every bite. So on this fine evening I made a great call, Hecky’s ribs and baked beans did not disappoint. 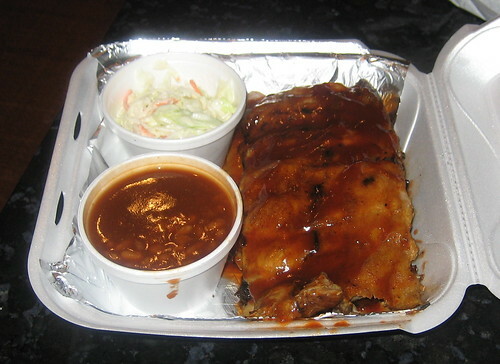 It was good all around – tender ribs and smoky baked beans. There wasn’t any special zing in the sauce, but it was tangy. I’m not necessarily going crazy over these ribs, but I made some errors when ordering so I’m taking responsibility. I should have ordered some extra sauce to help me understand it better and I should have taken a different route on the style choice. They give you two rib options. One is “classic” and the other is “Chicago style” (I think that’s what they termed them). As the woman behind the counter describes them, Chicago style are a little tougher and stay on the bone a little better. My wife and I opted for the classic because in general we feel that fall-off-the-bone is good. And they were good. But they went a little overboard with the fall-off-the-bone. These things fall off the bone more than any other rib I’ve had in Chicago. In fact, you can’t even pick them up by the bones because the gravitational pull of the earth is too strong for the meat/bone bond. It really piqued my interest to try the Chicago style. I think I’d definitely like the “tougher“ texture, so I’ll be back soon. Plus, there’s even more reason to be back if you listen to the majority opinion over at the LTH Forum, the fried chicken is supposed to rock (mostly at the Evanston location). As always with the LTH Forum, they denigrate the supposed “fake” Hecky’s that I frequent on Halsted. New and non-traditional usually gets panned. Whatever. Posted in food on 2007/11/12 by John.